Brief Description: MarinePure is designed to be a substrate for bio-filtration, specifically to target ammonia and nitrite removal (nitrification) and to minimize nitrates (denitrification). 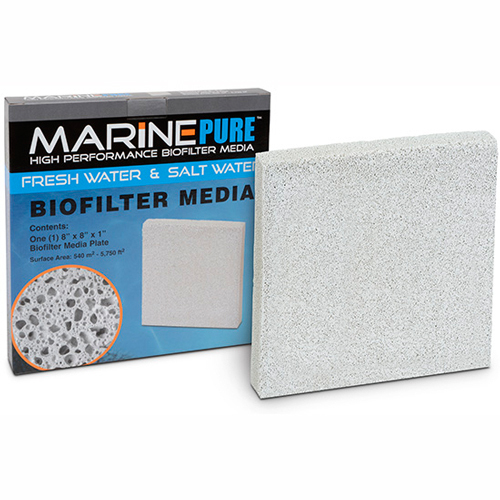 MarinePure is suitable for both freshwater and saltwater (marine) environments and can be used fully submerged or in trickle/shower filters. It is the perfect place for beneficial bacteria to flourish in order to remove harmful fish wastes. Notify me when "MarinePure BioFilter Media Plate [8 in. x 8 in. x 1 in.]" is re-stocked. A Combination of vast surface area and open/interconnected pores allow a thin bio-film to develop. This thin film allows bacteria to flourish because necessary nutrients are immediately available. With the open pores, old dead bio-film is easily flushed from the media and will not plug the media. Water flows through the media, not around as with other denser medias, thus utilizing the most surface area for beneficial bacterial growth. Rinse new media under tap water to remove any loose particles. Rinse again with tank water to remove any chlorine from tap water. Locate media in sump, under gravel bed, as part of a reef structure, or place directly in water flow.